Loose skin after losing weight. Not exactly lunch break convo. It is a real concern for women over 40 who have worked hard to lose weight. Whether it is excessive skin from being pregnant or from gaining weight over the years or both, loose skin doesn’t have to be your reality forever. After losing over 30 lbs, (Read how here) I had loose skin that bothered me. At the time, I wasn’t sure if it would ever shrink back to being tight. I did exactly what you are doing now, researched how to promote skin tightening after weight loss. It is understandable that for major weight loss surgery is sometimes the only option, but with these tips, most people can avoid surgery for loose skin. Hydration – Our bodies are made up mostly of water, so as it is with so many other issues, including weight loss, making sure you are always hydrated is only going to help. Read this if you aren’t sure how much water and why you should be drinking so much – The 411 on Staying Hydrated. Did you realize how much hydration affects your wrinkles? Weight Lifting – Our bodies are designed to have muscles for strength and every day use. Do not be deceived into thinking weight lifting is only for those extreme bodybuilders. Everyone who wants to stay fit and healthy should be lifting weights. Don’t underestimate the power of lifting 5 lbs regularly. Gaining a little muscle helps “fill in” the loose skin properly. Creams – I’m a little skeptical of this one, but there are a lot of creams that promise skin tightening results. 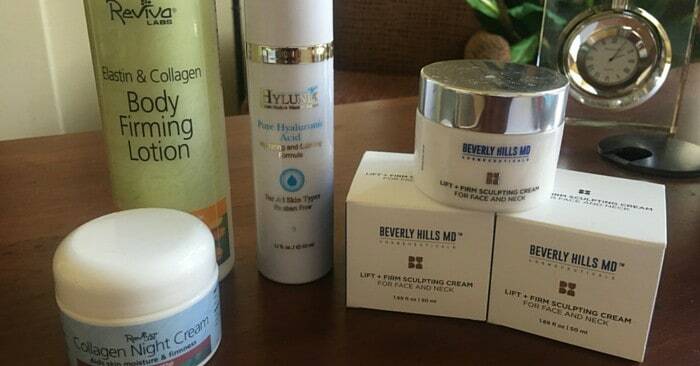 Every so often I research to find good quality creams for restoring collagen to my skin. I had not found one I wanted to try until recently, I finally thought I would give it a try. When I see the results from the cream I ordered, I will update this and let you know how it worked. If nothing else, make sure your skin is moisturized with a good lotion or cream to encourage the elasticity. I often used lotion (not any particular brand) on my stomach when I was pregnant and strongly feel that is why I don’t have any stretch marks. Update on Cream: So far I have tried a few of different creams. The Reviva did not seem to make a difference. The Hylunia is great for minor temporary firmness, is it not for long term correction. The Beverly Hills MD Lift + Firm Sculpting cream seems to be making a difference after only 1/2 of my first jar. I apply it twice a day on my face and neck. Beverly Hills MD cream update: After a full month of using the cream, unfortunately, I could not see a notable difference. Currently, I am using Vital Proteins Collagen Supplements to restore the collagen loss through aging. I have seen remarkable results with wrinkles and loose skin. My laugh lines seem to be decreasing in depth. Both Andrew and my mom can see a difference also and says I look younger. They actually noticed a difference before I did. I will definitely continue to use it to see future results. I will definitely continue to use it to see future results. Additionally, the collagen supplement has also helped my knee pain. This is my favorite! It can be added to anything without changing the flavor or the consistency. Give it a try for 6-8 weeks and I know you will see and feel a difference too! UPDATE: I have been using the Vital Proteins now for over 2 years with continued loose skin improvement and additional face lifting. I ran out once for a couple of weeks and my knee pain came back a little but diminished once I began taking it again. It’s a great product! If you want to learn more about my experience, be sure to check out Have I Found the Secret to Tightening Loose Skin After Weight Loss and Aging? Healthy Eating – This is the answer for everything weight loss and fitness. The good clean eating it just an overall great way to get healthy, and yes, even your skin. The better you eat, the leaner your skin will be to restore itself back to firmness. Vitamins – Vitamins are the ingredient to promote collagen growth. Collagen is what your skin needs to repair and restore elasticity. Vitamins A, K, E, C, Selenium, and Zinc build collagen. Take a multivitamin, supplements or monitor your food closely to ensure you are getting the recommended daily dosages. Time & Patience – This tip sounds like a dud, but it’s really true. As with all things in weight loss, it takes time for your body to readjust itself to the new you! From my own experience, the same tips for losing weight helped me with the loose skin issue. I still have some, but most of my loose skin has tightened over time. So be patient…it shrinks! How much time? I guess that depends on how long it was stretched. The longer it was stretched, the longer it will probably take to tighten back up. I guess that’s one of the reasons I am in love with fitness and feeling so healthy. The human body is so resilient. I spent years not taking care of mine until I noticed it wasn’t what I hoped it would be…now I’m showing it some attention and care and BAM…it responds and is getting back into the game again…well, with the exception of my back, but that’s another story. Read more HERE about how I lost the weight and kept it off. Join an amazing group of women over 40 supporting each other while losing weight! There’s no other group like it! Click here to join – Women Over 40 Losing Weight & Living Healthy. This is a very wonderful post you have shared here. When we gain fat, we always concentrate for losing our fat but perhaps we forget to think the condition after losing weight. We got lose skin which i think no one likes. This post has some amazing facts which are very beneficial in tightening our loose skin. I have been using many products from all Estée Lauder skin products to stem cell products to Glow Creme. I’ve tried nearly all of them. I also have been to a plastic surgeon 9 times. The surgeon will not do surgery, but I’ve undergone numerous laser procedures as well as Retin-A and Botox. Botox is miraculous… On day 5, magic does suddenly happen! Mine lasts for 5 months. The Glow Cremes arrived today so it’s too soon to report. I even have many of the Australian Earth Minerals products. Maybe I should start a blog? Haha! Thanks for the info! Did you like any of the cremes or have you only been happy with the Botox results? All good info, thanks! I’m really interested in the botox as well! How many units does it take for the tummy area though? I’m traveling to Asia soon and I’m thinking of doing it there because it’s much cheaper I heard. Nerium firming cream is the best! I don’t sell it so it’s pretty pricey for me, but worth it, I think. I will certainly remember this cream to try next, if needed! Thanks so much for the heads up on it! Have you looked into skin brushing? No, I haven’t. Have you? If so, how well did it work? Yes, I am interested as well to find out if the cream you were trying worked. Check out the update recently posted on the skin tightening creams. Let me know if you have any more questions! I’m sorry you have had a bad experience with them! So far so good here. I was set on the auto shipment and didn’t need another shipment yet. They were really good about reimbursing me for that. I hope you are able to get your money back! Hi Stephanie, thank you for these great tips. Can you update on effects of skin tightening creams? So glad the post was helpful for you! I have provided an update on the cream for you.